Studying indirect effects of environmental impacts, such as species extinctions and introductions, changes in productivity, and changes in disturbance regime, on complex ecosystems. Although much of ecological research has centered on the dynamics of single species populations or on one interaction between two species, real ecological systems are characterized by numerous species simultaneously interacting with each other. Such multiple interactions can produce indirect effects whereby an environmental impact affecting one species will ultimately influence the abundance of seemingly unaffected species, often in unpredictable ways (Wootton 1994c, 2002b). 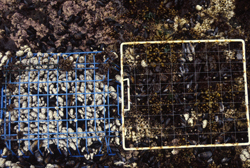 In my research, I conduct experimental manipulations of species in experimentally-tractable ‘model’ communities (rocky intertidal and river systems) to increase our understanding of the mechanisms and consequences of indirect effects, with the ultimate goal of developing a predictive framework for how they will play out. For example, I have simulated extinction events by experimentally excluding birds and invertebrates from portions of rocky intertidal shores (e.g, Wootton 1992, 1993a,b, 1994b, 1995, 2002a) and fish from portions of tropical and temperate rivers (e.g, Wootton and Oemke 1991, Wootton and Power 1993, Wootton et al. 1996a). A variety of issues have arisen from this work, and I am currently pursuing a number of these. For example, it has become apparent that uncovering indirect effects is extremely tricky, and this difficulty limits our ability to understand their role in real communities (Wootton 1992, 1994a, 1994b). Therefore, I explore appropriate methods for uncovering indirect effects. My successful application of structural equation modeling (path analysis) to complex ecological communities illustrates one approach I have taken (Wootton 1994b, 1995). Additionally, my work has identified two fundamentally different ways in which indirect effects can arise: through chains of linked species interactions (mediated by changes in density) and when a species modifies the interaction between two other species (Wootton 1992, 1993a), which occurs when species either alter traits of other pairs of interacting species or when species change the environmental context in which interactions between other species take place (e.g., intertidal invertebrates change how cryptic diffrent limpet species appear to birds [see photo]). The latter type of indirect effect represents an emergent property of multi-species communities that cannot be treated easily within a classic reductionist framework (i.e. studying how species pairs interact), so determining the relative importance of these types of indirect effects is of interest. The complexity of ecosystem response revealed by my experiments poses a major challenge for ecologists: how do we place such complex systems within a predictive framework? Effectively keeping track of how multiple pathways of potential impacts play out requires mathematical frameworks that can be linked to empirical data. Much of my current research is focused on addressing this challenge. Which theoretical frameworks seem most promising to apply? How do we effectively estimate parameters to constrain model predictions? What mathematical functions best describe interaction modifications? A key feature of mathematical frameworks likely to be of most use is that they be capable of synthesizing multiple processes (various types of species interactions, system productivity, disturbance and stress). 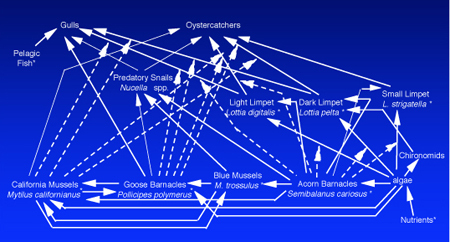 Dynamic models of food webs represent one promising framework because of their flexibility in linking consumer-resource interactions, competitive interactions, limiting nutrients, disturbance intensity and environmental stress. Initial experimental manipulations of key species and limiting resources such as light, in combination with comparisons of large-scale perturbations such as damming rivers has indicated that such dynamic food web models can provide useful predictions about how ecosystems respond to environmental impacts (e.g., Wootton and Power 1993, Wootton et al. 1996a,b, Power et al. 1995; see River Ecology for details). A version of these models in combination with a large-scale experiment has also been used to understand the role of ecological context on the dynamics of the Lyme Disease pathogen (Tsao et al. 2004). A key goal now is to identify ways to estimate the strengths of species interactions in the field to make more precise predictions (see Interaction Stength for details).